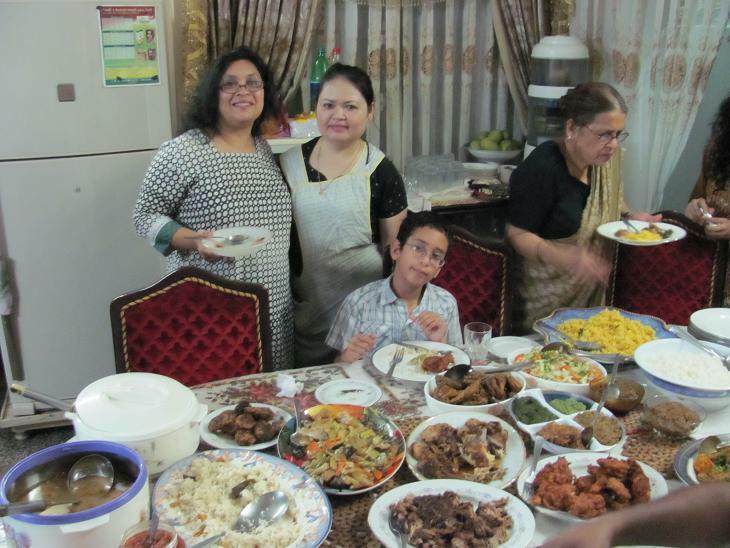 Bengalis (people of Bangladesh and the Indian state of West Bengal, as well as people who share Bengali heritage) are renowned for their hospitality. If you stop by for a visit — no matter the time of day and how busy life maybe — you will at least be offered a cup of tea and usually a small snack to accompany it. If you're visiting after a long absence, there will be feasts to welcome you back. Traveling back to Bangladesh after 10 long years, I expected some festivities. What I didn't count on is the "jamaii" factor. Jamaii is the Bengali word for "son-in-law." If ordinary people are treated most graciously, jamaiis are treated like God's gift to the family, world and universe. After a wedding, the newly married couple is feasted and feted almost nonstop for a year. Now, after 11 years of marriage, two kids, countless diaper changes and loads of laundry later, I can't be blamed for not envisioning my darling husband in the glowing aura of a new jamaii. However, my Bengali family and friends, who last met my husband when we'd first got married and then only for about two weeks, still considered him new enough to celebrate. The fact that he happens to be a tall, charming Texan also probably was a factor. We were overwhelmed by the feasting. A dinner party wasn't just a dinner party; it wasn't even an ordinary feast. No, it was extreme feasting (yes, there's a reality show waiting to be made). Cooks didn't just prepare a party menu, but seemed to make their entire repertoire of culinary achievements. For example, one of my uncles (a sailor) married a very nice lady from Thailand. When we were invited to their home, my Aunt Penn (in the apron) made Thai dishes, Bengali dishes and Western dishes. This translated into two types of soup, two types of roasts, two types of curries, two types of rice, three chicken dishes, three seafood dishes and several vegetable dishes (I got tired of counting). And then there was dessert (many different kinds) and, of course, tea. Knowing how much time and trouble the cook had spent preparing the feast, I felt obligated to taste each dish that had been cooked (fortunately, some of the sweets were store-bought). As a result, I could only have a few bites of each one (even the ones that made me swoon at first bite), but still ended up stuffed to the point of discomfort. Yes, another consequence of regular feasting was a tender and upset tummy. Not surprisingly, some of my favorite dishes during this trip turned out to be the simplest. Simplicity sometimes is priceless. One dish was pishpash, a thin porridge of rice and vegetables often fed to infants and the ill. Sometimes lentils or other protein are added. Light with a subtle flavor, it offers both sustenance and comfort. My mother always makes me pishpash when I'm under the weather. 1 Heat oil in a small saucepan and cook onions. When almost translucent, add whole spices, rice and protein (if using). Cook for about 1 minute or until fragrant. 2 Add ginger, vegetables and liquid. Bring to a simmer and lower heat. 3 Cook until rice and vegetables are soft. Stir enough to mash some of the ingredients until you have a thin porridge. Remove whole spices. 4 Season with salt and pepper and serve with lime wedges for squeezing.